imported grape leaves stuffed with seasoned rice smothered in our homemade “lemóni” sauce. semolina pasta in a hint of olive oil, with herbs and dried cranberries. seasoned romaine, green leaf and radicchio lettuce, feta cheese, kalamata olives, salonica peppers, tomatoes and our own balsamic vinaigrette dressing. refreshing fresh cut tomatoes, cucumbers, and onions, dressed with a light sprinkle of our own balsamic vinaigrette and topped with feta cheese, kalamata olives and served with a chicago style or whole wheat pita. ripe red tomatoes and fresh mozzarella cheese finished with balsamic vinegar, olive oil and fresh chopped basil. 1/4 lb. 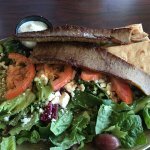 meat choice with a tossed greek salad, tzatziki sauce and a chicago style or whole wheat pita. 1/4 lb. 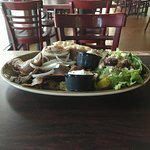 meat choice with seasoned lettuce mix, topped with sauteed greco roman veggies, mozzarella cheese, balsamic vinaigrette dressing with a chicago style or whole wheat pita. a mild, yet flavorful blend of seasonings mixed with hand-pulled chicken and a hint of cranberry citrus dressing. served over a bed of seasoned lettuce with tomato, olive, and pepper garnish. chicago style or whole wheat pita is optional at no charge. fresh cut parsley, imported bulgur wheat, diced tomatoes and onions, a hint of mint with a zesty spray of lemon juice. greek-style chicken broth soup with lemon and nisí orzo. 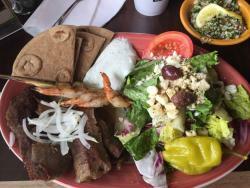 served with a chicago style or whole wheat pita. imported lentils, stove-top simmered with veggies and veggie broth. 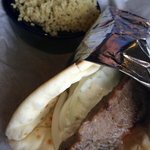 served with a chicago style or whole wheat pita. check out our chalkboard for favorites from the mediterranean and beyond. hand-breaded, lightly fried tilapia filet, with lettuce, tomatoes, onions, house-made ‘lemoni’ sauce with your choice of a greektown sm side. falafel with hummus, seasoned lettuce mix, tomatoes and your choice of dressing wrapped in a chicago style or whole wheat pita with your choice of a greektown sm side. 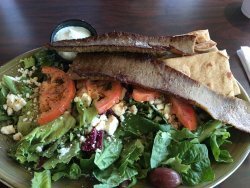 seasoned green leaf and romaine lettuce wrapped in a chicago style or whole wheat pita with onions, tomatoes, sliced black olives, feta cheese, salonica peppers and vinaigrette dressing with your choice of a greektown sm side. 1/3 lb. 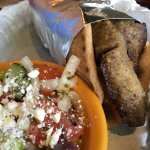 certified angus beef patty wrapped in a chicago style or whole wheat pita with onions, tomatoes, and crumbled feta cheese with your choice of a greektown sm side. 1/3 lb. certified angus beef patty with mayo, mustard, onions, lettuce and tomatoes on a sweet sourdough bun with your choice of a greektown sm side. with or without cheese. savory seasoned 7oz. flame-grilled chicken breast, with lettuce, tomato and mayo, served on a sweet sourdough bun with your choice of a greektown side. 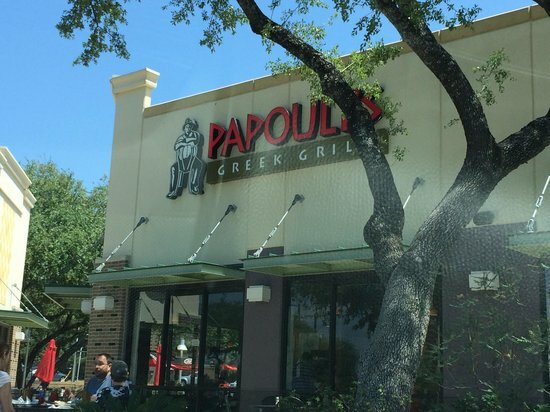 our in-house, baked daily baklava crumbled over a scoop of blue bell® vanilla ice cream. fresh-made egg custard delight with fillo, drenched in honey syrup and sprinkled with cinnamon. served hot or chilled. walnuts and cinnamon layered between buttered fillo covered with honey syrup. tangy greek yogurt with a dash of raw honey and topped with a dried fruit medley. Хорошее место для греческой кухни. Довольно быстрое обслуживание, хотя они забиты на обед. Хорошие цены, чистое место. Многие здоровых блюд Я очень рекомендую его. Хорошее, быстрое и дружелюбное обслуживание. Средиземноморский салат с курицей был вкусным. Большие порции. Цены не были слишком дороги. Хорошее расположение. Мы вернемся. Не так много грека об этом, за исключением имени, дедушка не был гордым. Очень хороший гамбургер ягненка, даже если они вышли на него. Очень Хороший, но не отличный. Отличный, дружелюбный персонал, большие порции вкусных салатов и белка.Это был наш второй визит, мы не были разочарованы. Это не лучший греческий в Техасе, но это один из лучших в SA. Получите быстрые ответы от сотрудников и посетителей (Papouli's).